SALEM — Over the past two decades, solar electricity in Oregon has moved beyond residential rooftops, with more and more electricity coming from commercial and industrial projects. Visualizing this rise in renewable solar electricity generated statewide is now easier than ever thanks to a new Oregon Solar Dashboard launched by the Oregon Department of Energy. The Oregon Solar Dashboard shows the rapid expansion of solar facilities between 1999 and 2018. Nineteen years ago, only a handful of residential arrays were scattered around Oregon. 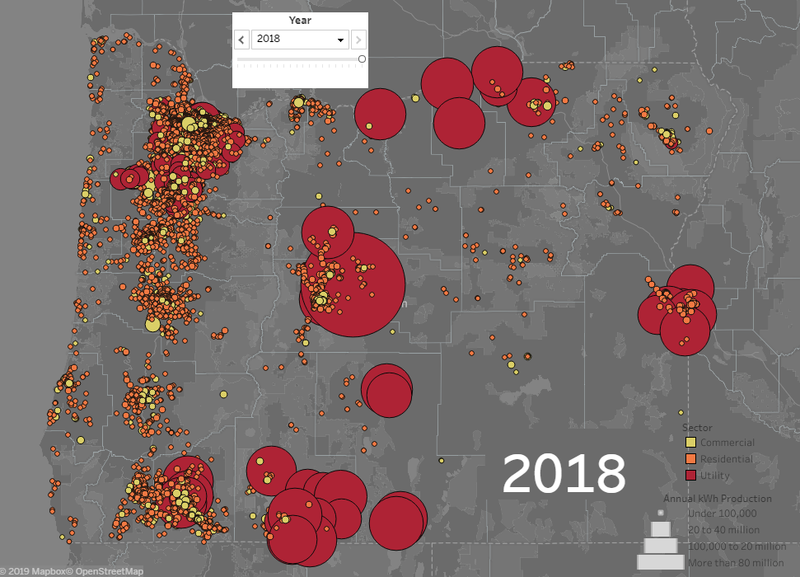 Now, the most current dataset available shows how quickly – and where – residential, commercial, and utility-scale solar facilities have populated throughout the state. The dashboard also shows the dramatic decrease in solar electricity’s cost per watt (75 percent reduction since 1999! ), the increase in the sizes of residential systems over the years, the state’s largest utility-scale projects, and the amount of solar located in each utility’s territory. The Oregon Department of Energy worked with regional utility, solar industry, and community partners to develop the dashboard as part of a larger effort to quantify trends in the energy sector and make data available to stakeholders in user-friendly formats. The work was made possible in part through a federal grant provided by the U.S. Department of Energy; known regionally as Solar Plus, the project includes partners in Oregon and Washington working together on strategies related to community solar, grid resilience, and energy planning. ODOE relied on its own data as well as data from Portland General Electric, Pacific Power, Idaho Power, Eugene Water and Electric Board, and Ashland Municipal Electric Utility. Regional partners include Energy Trust of Oregon, Renewable Northwest, Oregon Solar Energy Industries Association, and the Northwest Power and Conservation Council, which supported the project through data sharing and design support. The dashboard is still a work in progress. ODOE will continue to work with stakeholders to update the data over time and make improvements. If you have comments or suggestions about the project, please send an email to: askenergy@Oregon.gov.